Catering van trader, street food vendor, outdoor caterer, hot food trailer… if you are a mobile caterer we’ve got you covered. 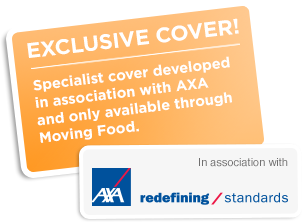 We have teamed up with AXA, one of the largest and most trusted insurers in the world to develop our own exclusive covers. Designed for mobile or fixed catering trailers, covering your trailer as well as fixtures & fittings. Public and products catering liability insurance is also included in the cover. A liability policy for all outside caterers who don’t need cover for a vehicle. Employer’s liability and public & products liability with optional cover for your business equipment. Specialist cover for your and your vehicle if you run a hot food van, ice-cream van, mobile drink service or similar business. Public and products catering liability insurance cover can also be included in the cover as well as optional breakdown recovery cover. Whether it’s a one-off event or you want cover for many events over the course of the year this policy is perfect for you. It covers you against any injury or property damage arising out of an event. Up to 5,000 visitors as standard but we can tailor this cover to your business. Great people to deal with, they really know their stuff. Glad I spoke to them – I’d recommend giving them a chance.